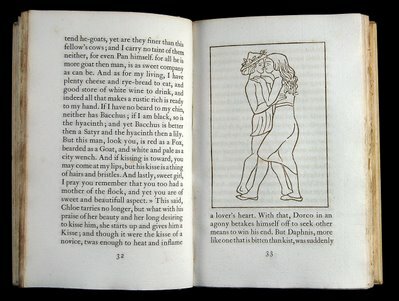 Anyone who has read our Bibliography, heard any talks we have given or talked with us for any time will know that the printer, Nicolas, has had no formal typographical training at all but puts whatever ‘eye’ and ‘instinct’ he may have developed in the design of books down to a lifetime of studying other people’s. I love to share my favourites and, because I can post a number of photographs here which can be enjoyed at leisure, this seems a better way of doing this than putting a single photo in a book or flashing a slide on a screen. This first book has, for years, been a complete favourite. Just to turn the pages brings tingles to my spine. Every thing about it is perfect . . . and perfectly SIMPLE. 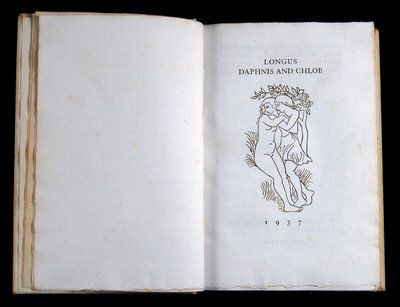 The text is Thornley’s translation (1657) of Longus: Daphnis and Chloe and it was printed, on his hand-press in Paris, by Philippe Gonin in 1937 and was published by A. Zwemmer in London. The exquisite woodcuts are by the sculptor Aristide Maillol. 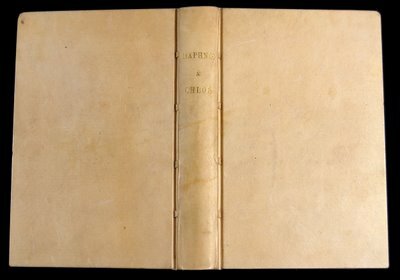 The format is not large so that the book sits comfortably in the hand. 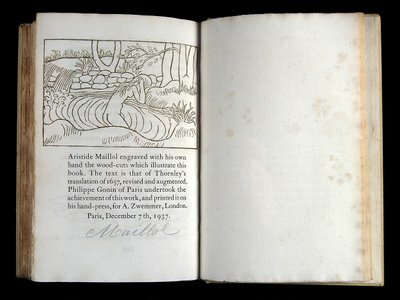 The paper “hand-made paper manufactured by an old process rediscovered by Aristide Maillol” is a thickish, laid sheet of extraordinary colour and consistancy which takes the letterpress superbly, though with some see-through. The text is printed in a black ink with a greeny-brown admixture which gives the feeling that the words have emerged from the ground of the paper rather than being printed upon it. Then comes the coup de grace. 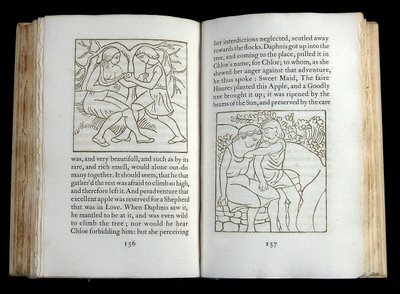 The woodcuts, in which the whites of the design are as important as the lines, have been printed in a colour which is almost beyond analysis. It is lighter than the type ink, it is slightly greener and slightly more brown. 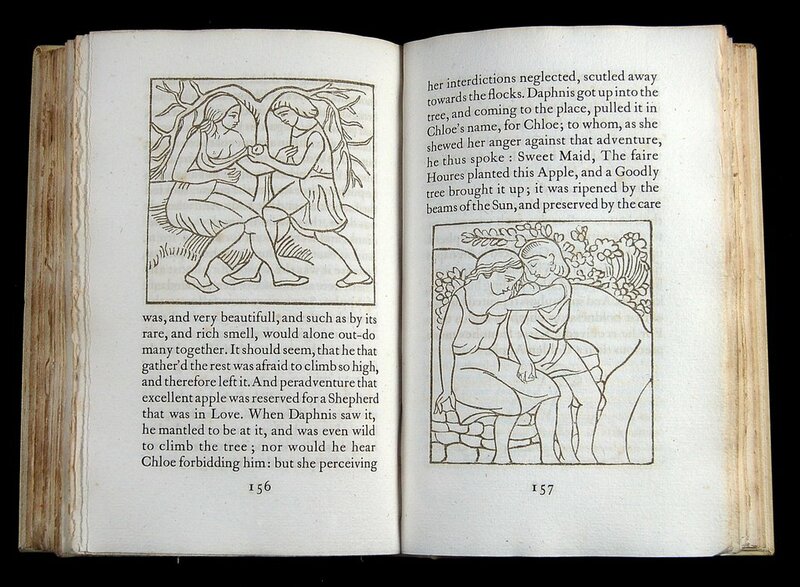 It makes the images stand apart from the text totally but the difference is so slight and so subtle that both elements are melded together in perfect harmony. 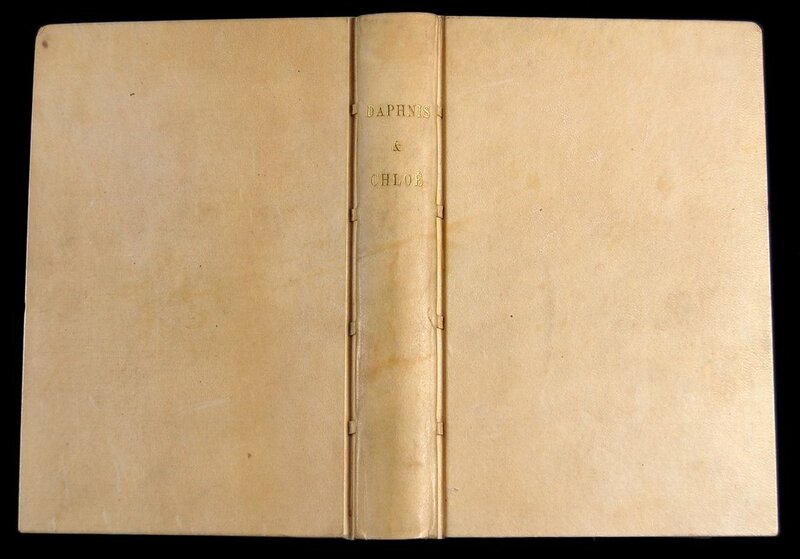 The binding is the simplest – vellum which seems just a variant of the text paper in colour and feel with minimal blocking and simple bands. 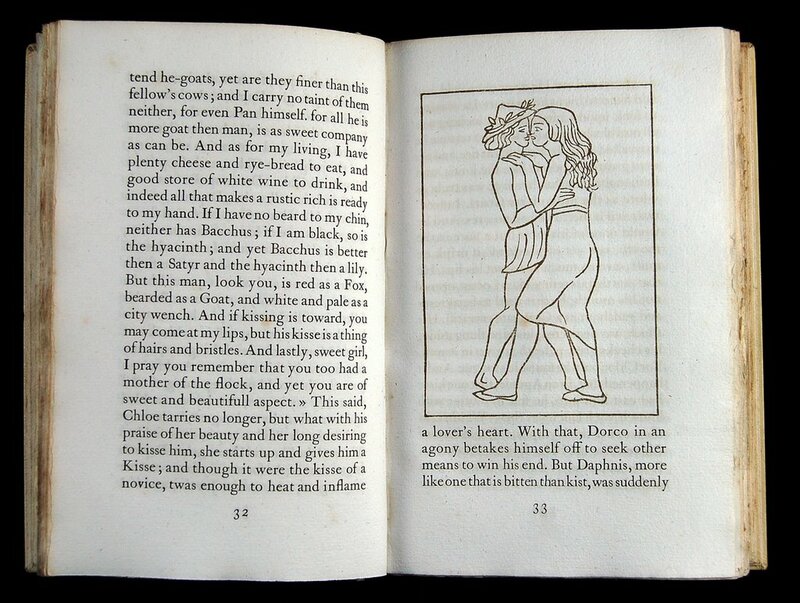 Finally, and this is something I cannot help you with, the book has a wonderfully subtle smell! That’s all I am going to say. I will just let the photographs say what they can.